Showing results for tags 'great lakes'. How Would You Fish and Extremely Large Body of Water? 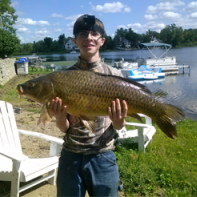 I'm a Michigander and I really want to try carp fishing in the great lakes but I don't know where to start. I'm just baffled at the size of them when ever I'm there or looking at it on Google Earth and it's pretty intimidating. Do I simply go up on the sandy beach and just cast out? Or should I fish rivers/canals that are very close, and connected to the great lakes or other inlets with a much faster drop off? Any advice?